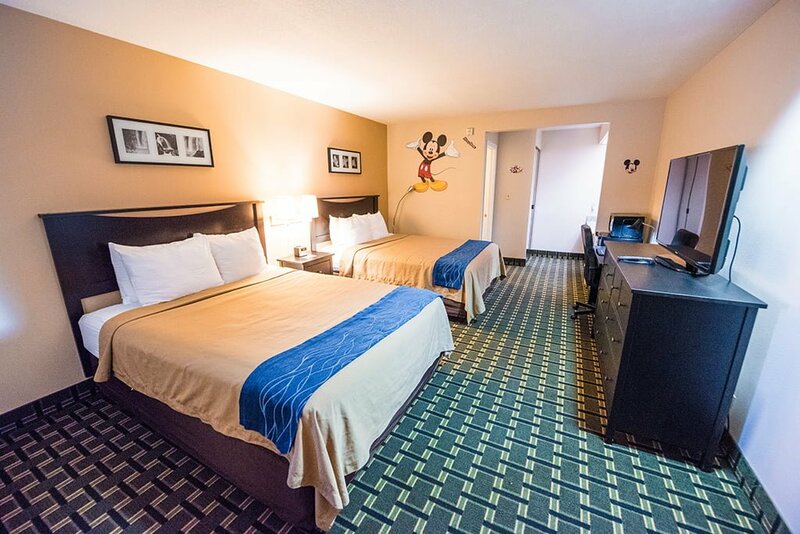 If you’re visiting Disneyland on a tight budget or are attempting to save money, the easiest way is to book a cheap Anaheim hotel. In this post, we list the 10 best ‘value hotels’ near Disneyland, with a brief discussion of the strengths and weaknesses of each, along with the sacrifices you’ll be making by choosing these inexpensive hotels over pricier counterparts. Without question, hotels are the biggest variable when it comes to your Disneyland vacation budget. On one end of the spectrum, there are dated motels that can cost well under $100/night. On the other end, suites at the Grand Californian Hotel that easily exceed $1,000/night. Even ignoring these extremes–which most people should and will do–the prices of standard, “good” hotel rooms in Anaheim can vary by $300/night. Over the cost of a 5-day trip, that’s a pretty big swing in how much you’re spending. Of course, the quality of hotels across price-points also varies considerably. We think sheer quantity and range of hotels near Disneyland is a huge asset when planning a trip, but all hotels on the cheap end of the spectrum are not equal…hence this post. While we don’t put a ton of stock into TripAdvisor ratings, we also would not roll the dice on any of the hotels that readers review as the bottom 20-30 in Anaheim. Almost all have names that are a bit “off,” such as the Super 7 Motel or Robinhood Motel. Oh, and something tells us that the Polynesian Motel is not the sister property of the Polynesian at Walt Disney World…but that’s just a guess. A couple of notes before we get started. First, unlike Disney hotels that have published rate charts, Anaheim hotel prices are like airfare, with rates fluctuating pretty significantly depending upon demand. It’s not uncommon to see hotels at double their ‘normal’ price for no discernible reason while comparable options remain around the norm. This makes comparison shopping a strict necessity. It also means some hotels on this list could be inexplicably overpriced at times. Second, speaking of double their normal price, expect those normal prices to about double once Star Wars: Galaxy’s Edge opens next year. Pre-Cars Land, it was common to find hotels within a 10 minute walk of Disneyland for under $100/night. Now, the average nightly rate at Anaheim hotels is $180.75. (And that includes hotels much farther from the parks.) With a hotel shortage and construction that is just now starting to catch up to demand, we fully expect prices to spike next year. Finally, we give extra consideration to hotels that are mainstays of last minute booking sites or apps like Hotel Tonight, and we also to hotels that participate in Get Away Today’s 3rd or 4th night free promos. Booking via one of these methods is one of the last remaining ways to get a decent hotel for around (or under) $100/night in the off-season. Extended Stay America is not typically going to be on your radar if you’re pricing out hotels near Disneyland, because standard rates tend to be around $100/night. Given the nature of this barebones, extended stay hotel, that’s nothing special. However, it’s often the cheapest 2-star hotel in the Disney South zone on Hotwire’s “Hot Rate” section, with rates that rival some of the shady motels in town. Extended Stay America is definitely not shady (the drab photo above really doesn’t do it justice), it’s just basic. If you can find a way to book it at a low cost, it can suit you well. With a location on South Manchester, this Holiday Inn is a bit of a hike from Disneyland and Disney California Adventure. However, for the cost difference, you can take an Uber or use ART and still come out ahead. (I walked the ~30 minutes when I stayed here–I didn’t think it was too bad.) 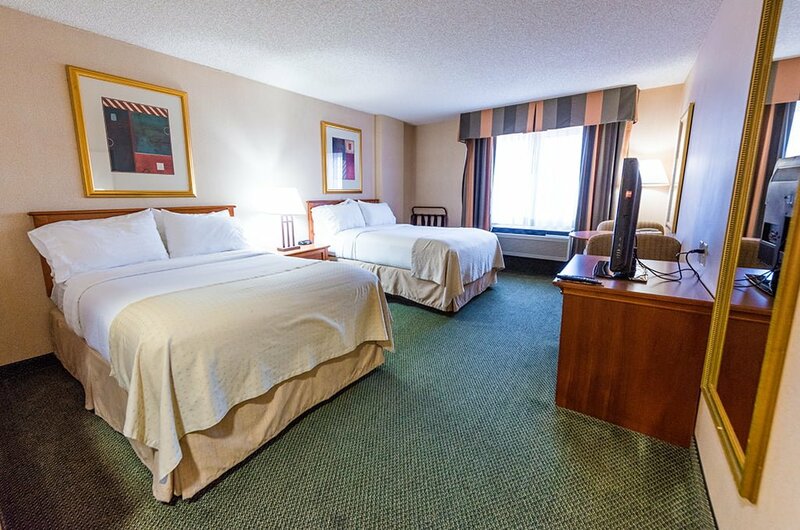 The main reason I’m inclined to include this Holiday Inn on the list is because it’s one of the few chained-brand hotels on the list, and has an impressive slate of amenities. Although rates can fluctuate widely, it’s not uncommon to find this for under $100/night during the off-season. 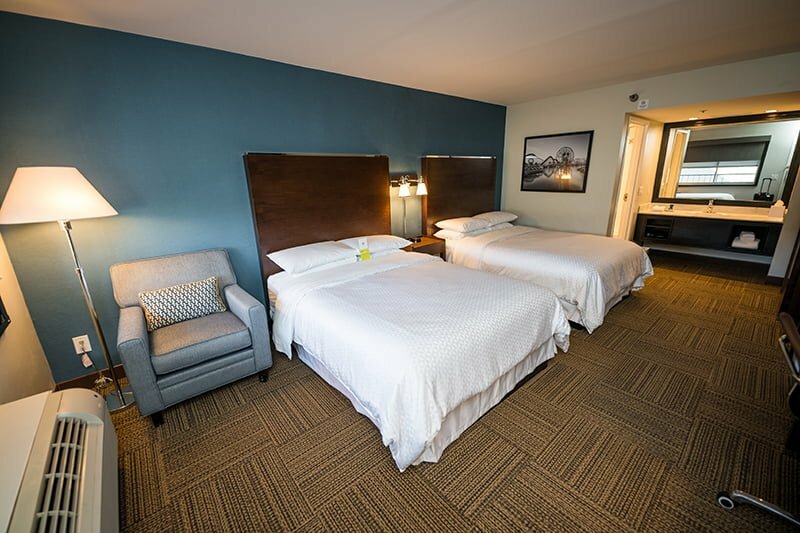 Read and see more in our Holiday Inn Anaheim Resort Area Review. 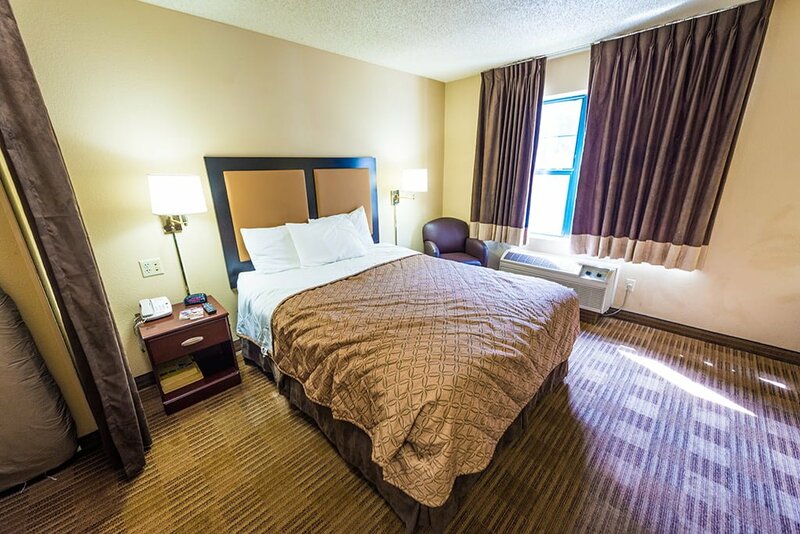 We’ve described Cortona Inn & Suites as the epitome of an average hotel in Anaheim. The rooms, amenities, breakfast, and pool are all “fine.” There’s nothing exemplary about it in any way…except the price. It is regularly the cheapest hotel near Disneyland on Hotel Tonight (even taking into account the preposterous resort fee). It also has “free” parking, which is becoming increasingly rare in Anaheim, so at least that resort fee is good for something. Read and see more in our Cortona Inn & Suites full review. Although we stayed in this hotel last fall, I still haven’t gotten around to actually reviewing it, in large part because it’s just so boring. As I’ve noted elsewhere on the blog, time has passed this Anaheim Convention Center hotel by, but even though the dated interior feels like a time capsule of a different era (perhaps I should review it from the perspective of a time traveler to mix things up?!). In any case, the rooms are also surprisingly nice and spacious, and are better than you’d expect for the price. While I’ve never seen Clarion Hotel on Hotel Tonight, Get Away Today offers packages with the 3rd night of stays being free, plus free parking and free breakfast. As odd as this might sound since it’s a cheap hotel across the street from Disneyland, there will always be a special place in my heart for Desert Inn & Suites. It was our go-to choice for a while, and I still “remember” stumbling back here after nights of ElecTRONica. The look of the rooms hasn’t changed much since then, and neither have the prices. Someday, I fully expect that we’ll take our grandkids to Disneyland and we’ll walk into our ~$100 room at Desert Inn to find it still has that same gilded, floral bedspread. 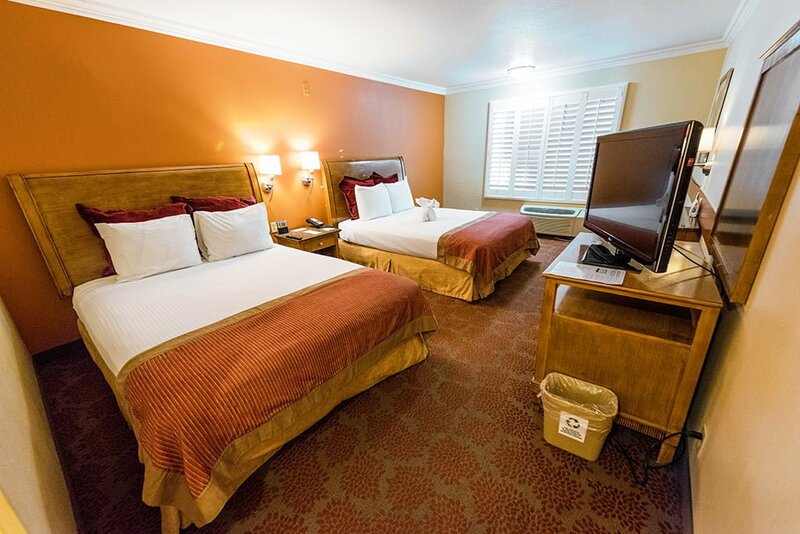 Read and see more in our full Anaheim Desert Inn & Suites Review. That covers it on our favorite cheap hotels near Disneyland…for now. I’ve only included hotels at which we’ve stayed, meaning I’ve had to skip over hotels like Portofino Inn & Suites, Anaheim Hotel, Red Lion Hotel Anaheim Resort, Country Inn & Suites Anaheim, and others. Since we’re anticipating that Star Wars: Galaxy’s Edge will put prices at the Polynesian Motel on par with the Polynesian Village Resort (okay…mild hyperbole), we realize we need to review more value options. We’ll be testing as many of those out as possible in the near future, as we’d like to bump #8-10 off of this list. 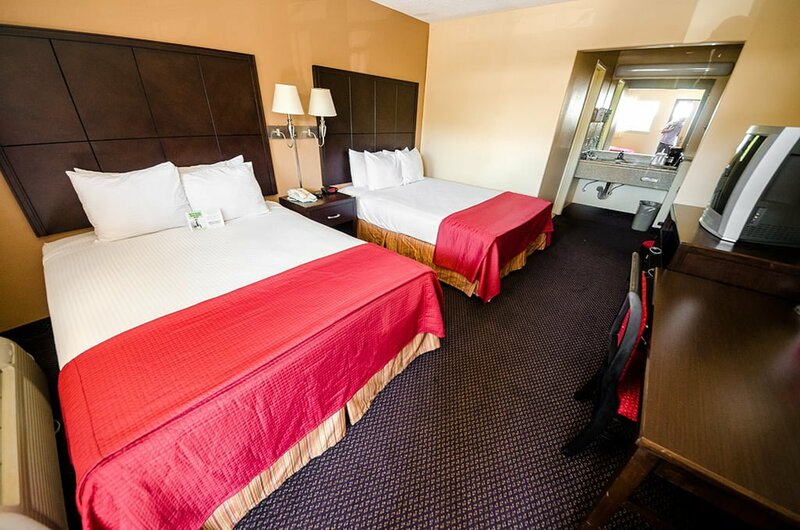 Have you scored any great hotel deals in Anaheim? Where, when, and what nightly rate? Do you agree or disagree with our list? Other recommendations to add? Any questions? Hearing feedback about your experiences is both interesting to us and helpful to other readers, so please share your thoughts or questions below in the comments! Sorry if this is a silly question, but if we booked a reservation for Desert Inn for August 2019 and prices go up by then they aren’t able to change our reservation price right if we’ve already got a confirmation number right? No they can’t. Once I booked at the Park Vue many months prior. When I checked in they were so impressed with the rate I booked it at because the going rate at that moment was way higher. I was so glad I booked early!! Stayed at the Anaheim Hotel in June 2018, thought it was fine, liked the big pool. The refurbished foyer was a bit nicer than the room but it had everything with comfy beds. Didn’t have a car, I think it charges for parking. This is a very nice motel. We’ve stayed there twice in the past 4 years. You can’t get much closer to the main gate of Disneyland. The pool is fine, nothing special, and the breakfast had quite a few good offerings. My opinion is that you’ve made a very good choice at an excellent rate. we stayed there last april for a 6 day DL trip. WE LOVED IT!!! The pool was small but the weather was cold so we did not swim anyways, the room was clean and super close to disney. We were watching fireworks and back in the room 9 minutes afterwards. We stayed there in June 2015 for the 60th Anniversary. It was clean and the breakfast in the building next door was ample. Parking was free as well. The location is next to perfect, right at the crosswalk to the entrance to Disneyland and California Adventure. We were also a family of three, our then 14-year-old slept on the sofa (he didn’t bother pulling it out to the sofa bed – he just put the sheet on the sofa). As I’m disabled, the close walk was awesome. Any tips for a family of six choosing from this list? We have a *strong* preference for walking-distance hotels, meaning no more than 20 minutes at a kid’s pace. We need three beds, but one of them can be a sofa bed. TIA! 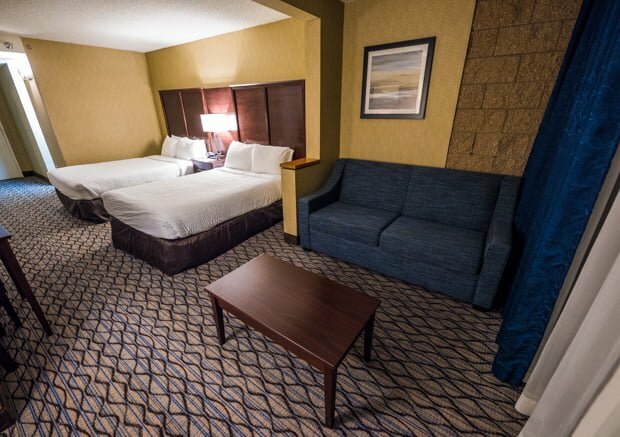 The Holiday Inn Express and Suites on Manchester behind the Marriott Courtyard has two bed and a sofa bed option. Newer and nice, small pool. The Marriott also has bunk bed options for a larger family, but is more expensive. We’ve been. Enjoying the grand legacy at the park the past few times we’ve been to Disneyland. They often have an annual passport special, and we found rooms for under $100. The rate is usually about $120 plus tax, which pushes it into the $140 a night range, but the location is pretty good. Room quality can be a little hit or miss, but they’re not awful for the price. I wish parking was included. The Park Vue was definitely the best location for the money the first time we went, and I’ve been so disappointed that the rates went up so high! I think we might try a couple of hotels from this list when we return for trips in the fall. Thank you so much for providing this information! You have been my go to source for tips and tricks on our visits. We use a hotel CC all year (Hilton Amex) then use our points to stay at Hilton Anaheim, great pool, walking distance, Starbucks in lobby for early morning starts. Typically stay a week for free. We use the card for all purchases then pay it every month, no interest payments and free week at Disneyland area hotel. Tom, what are your thoughts about Homewood Suites by Hilton Anaheim Resort Convention Center? 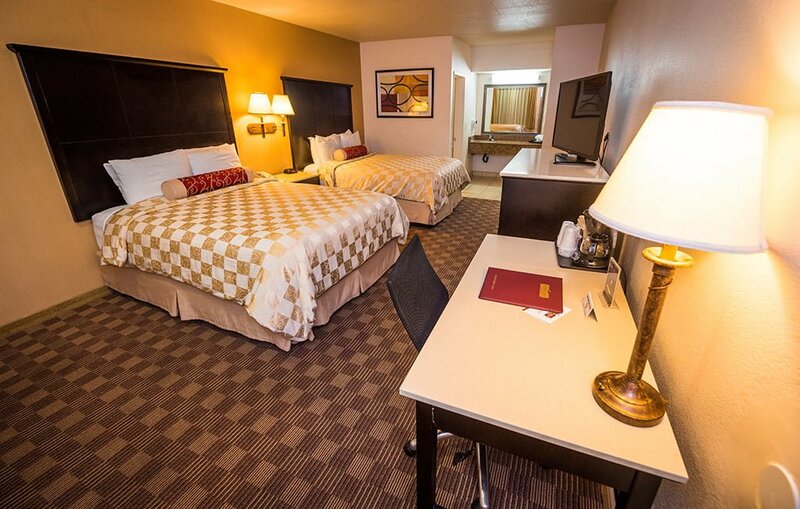 If Desert Inn is unavailable or more expensive, we like the Quality Inn and Suites on South Manchester. No resort fee, parking fee applies only if you have a car. The single queen rooms are usually well under $100, two doubles float around $100. Breakfast is reasonably robust for the price range — make your own waffles, biscuits and gravy, powdered egg patties, yogurt, cereal. Or just order ahead and pick up muffins at Mimi’s on the way to the park. We’re trying Del Sol for the first time for an upcoming visit because my kids really want bunk beds, but that’s basically a 50% bump in price (which we can totally afford, but I’m a cheapskate). Thanks a ton for this. Seriously, you are awesome for giving this type of advice so those of us that are on the bubble can afford a DL trip. The Four Points by Sheraton definitely looks like the nicest “budget” choice. The Clarion though is SO cheap in comparison to almost all other choices that I have a feeling that’s where we’ll end up. I’ve got a lot of work this summer so a Disneyland trip is finally a possibility. (With a WDW one potentially possible next year) I’m hoping to make it down in late August after school starts again, but before HM and SM close for their seasonal overlays so the husband can finally see the “regular” Haunted Mansion. It would be my first visit since 2005 and you have made it possible. I can’t thank you enough. Out of interest, have you ever had the motivation to explore or try out AirBnB in the US? I’ve spent quite a bit of time looking at it, and almost been enticed, but never stayed in one. I’m sure I’m missing out – everyone says they’re half the price of hotels and just as good – but then I am a fairly extreme introvert and view hotels as being worth about double the price. We use Airbnb all the time including in the U.S., albeit never in Anaheim. Can’t forget about that extra 25% you’ll pay in tax! Also, when we stayed last month at the Del Sol, we knew we would be paying a nightly parking rate but didn’t realize we would also be tipping a valet every time we needed our car. It seemed pretty common though with some of the older motels we walked by to have a non optional valet due to the older smaller lots in these motels being a tight squeeze with today’s cars. And contrary to how we normally book our hotels (3-4 months out), we booked Del sol almost 9 months out and got a pretty good deal $98/night. If you can get it for under $140/night, it absolutely would belong on this ‘cheap’ list. The problem is that whenever I’ve checked recently, the cheapest available room has been $159 (or higher) and I haven’t seen it on Hotel Tonight in ages. Perhaps I’ve just been unlucky. Plus there is no elevator and the breakfast is upstairs! Love the Park Vue Inn. Closest inn to Disneyland (Outside of Disney Hotels. Rooms are fairly “motel standard”. But, they are very clean. And the staff are friendly. This is a family owned inn. I prefer staying here, if available. Stayed there 5+ times. We just stayed at Peacock Suites @ $109/night and the bus stops right out front, 1 mi from DLR, in a 1-bed suite with kitchenette, 2 TVs. Rooftop deck, pool table, foos ball, covered pool. Best price found through airbnb. Would stay again in a heartbeat! Nice! As much as it pains me not to be within walking distance, I think this approach–being about a mile or so away and using ART or other shuttles–is going to be an increasingly good strategy, especially next year when Star Wars land opens. Hi Tom! I stayed at a hotel a little more offsite recently specifically to see what it was like to not be walking distance. I find the hotel prices for the walking distance hotels to mostly be crazy for what you get. I have to say I was pleasantly surprised. While you have to wait on the ART bus to come vs being able to just walk to the park when you want with a closer hotel, it sure saves your feet. And after a day in the parks I didnt mind waiting 10 minutes on a bus vs having to walk 15 more minutes to a hotel. You can buy the ART tickets via an app. And there is always Uber/Lyft- however I’ve encountered a LOT of surge pricing lately with Uber.